Field Day hosted by Action Cycling Atlanta was a popular event in the early 2010s where hundreds of participants had fun playing schoolyard style games while raising dollars for Atlanta area charities. After the original founders decided to sunset the event due to other priorities, Action Cycling Atlanta (ACA) re-started the event in 2018 and it quickly became one of the key sporting/social events in the spring. The event returns on April 6, 2019 on Emory University's campus in support of ACA's efforts to raise awareness and funds for HIV/AIDS research and support Atlanta area AIDS service organizations. 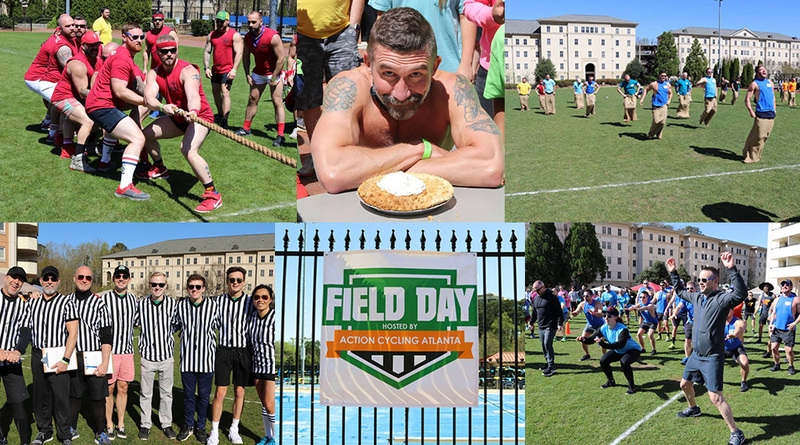 Field Day is a fun, one-day event that takes place on Emory University’s beautiful campus where friends gather to have fun, compete and support a great cause. At the starting lines, 4 teammates form a line on both sides of the field, standing front-to-back. The first contestant will run 30 yards towards their teammate while balancing an egg on a spoon and pass the egg onto their teammate's spoon and that teammate will race back across the field where they will pass off the egg to the next teammate. If the contestant drops the egg, they may stop and scoop it up from the ground using only their spoon. Teammates face each other (starting 5 feet apart). Teammate will toss the eggs to each other and after each toss cycle, both teammates will take one full step backwards and repeat. If the egg hits the ground at any time then that pair is eliminated. The last team standing wins. The first contestant will grab an egg, place it between their thighs, race 30 yards across the field and drop the egg into the bucket. If at any time the contestant drops the egg, the contestant must stop, pick up the egg, place it between their thighs and continue across the field. If the contestant does not drop the egg into the bucket, they must pick it, place it between their thighs and try again until they ring the bucket. Contestants will race back across the field and relay with the next teammate. At the starting line, while the teammate holds their legs, contestants race 30 yards across the field using only their hands. Teammates switch positions and race back to relay with the next pair of teammates. Contestants line up at the start line standing in their sack, then hop 30 yards across the field while wearing bunny ears, turn and hop back across the field to relay with the second pair, at which time teammate 1 will pass their sack to teammate 2. The first contestant will put on a Tutu, place their forehead on a pole, spin 5 full rotations while a teammate counts. The contestant will then run 30 yards, pick up an egg, and throw it to their teammate holding a bucket 10 yards away. The teammate must catch the egg in the bucket. Once the thrower rings the bucket the thrower will run back to the starting point, take off the tutu and pass it off to the next teammate. At the starting line, 4 Contestant pairs line up. The first pair will wedge a balloon between their chests or abdomens then race 30 yards across the field. When the pair reaches the end, they must pop their balloon using only their chests or abdomens. Once the balloon is popped the pair will race back across the field and relay with the next pair. Contestants hula hoop. If the contestant's hula hoop hits the ground, they are eliminated. 8 teammates line up front-to-back behind their bucket of water. Teammate 1 dunks their sponge into the bucket of water then passes it over their head to the teammate directly behind them. Teammates continue passing the wet sponge overhead to the last teammate who then takes the sponge and squeezes it into another bucket. That teammate will then run to the front of the line and dunk the sponge into the bucket of water and repeat the process. Teams may only use the wet sponge to fill their bucket. The team that fills their bucket first causing the Easter egg to float over and onto the ground wins. Two teams, each comprised of 8 teammates, face each other. A rope is marked with a "center line" and two markings. The teams start at a marked line with the rope's center line directly above a line marked on the ground. The teams attempt to pull the other team such that the on the rope’s center passes the team’s marked line. The winning team advances to the next round. The last team standing wins. NO CLEATS NO GLOVES. The contestant that eats and swallows the most Peeps in 60 seconds wins. When the whistle blows the contestants must raise both hands but must swallow what was already placed in their mouth.